The EV-Box charging stations were designed so that you can charge your electric car as safely and quickly as possible. One of the great advantages of driving an electric car is that you can charge the car at home: in front of the house, on the driveway or even in your garage. And this process is easy, quick and safe. The HomeLine was specially designed for your convenience. The HomeLine is compatible with all type of cars. You can choose from a wall model or a pole model and they can be supplied in any desired colour. Of course, all our charging stations are fully CE certified. The HomeLine includes either a socket or a fixed charging cable. As a standard, if you choose a charging station with a fixed cable, you will receive an effective length of 6 meters, but depending on the capacity of the station you can may receive an 8 meter cable. EV-Box settles your electricity costs automatically with your employer or leasing company, or between your business and private use. The HomeLine is available with a type 2 socket or a fixed 6m cable, mounted on a pole or onto the wall. 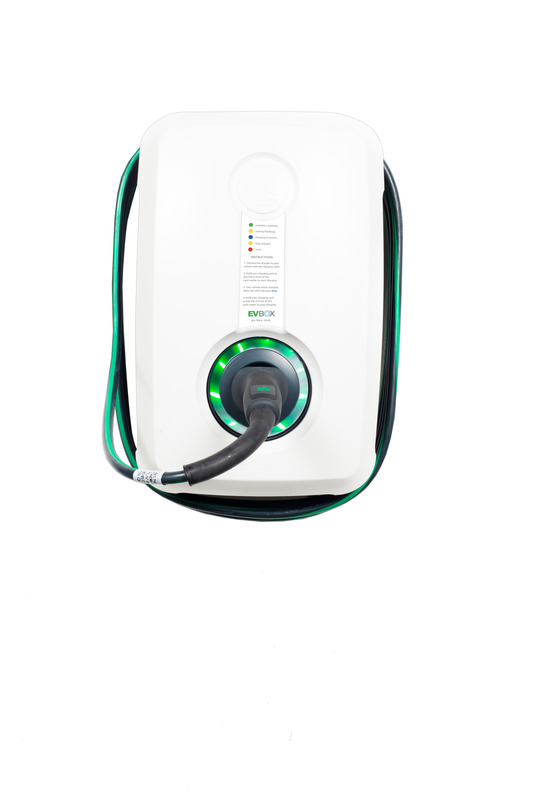 With a type 2 socket (a European standard), your charging station will be compatible with all electric car models. With an attached 6 meters cable, you start each charging session instantaneously and with ease, in any parking position possible. Click the button below to add the EV Box Home Line COVER-White to your wish list.